I knew I needed a killer opening line. It was the best of times, it was the worst of times, it was try time. They told me I’d never dance the tango again – but the rhythm said otherwise. I reckon my brother regretted teaching me how to throw around the time he saw the axe flying towards him. Yeah, that’ll do it. Not quite Hemingway but it’s a good place to start. I’ll explain. I was born in Sydney – not by choice. It was my parents’ fault. They were both serving in the Royal Australian Air Force and we were stationed in Wagga Wagga. They’d come a long way to end up there, too. Dad was born on Yam Island, in the Torres Strait, and was working on Thursday Island when the RAAF came knocking. There was a huge recruitment drive targeting the Torres Strait Islands, trying to convince men and women to head south to serve. Dad went along and listened to what they had to say. It sounded like a great opportunity to travel and experience things he’d never see otherwise, so he signed up. Mum, on the other hand, was living on a farm out in Western Australia. I doubt she’d ever have heard of Wagga Wagga, let alone the Torres Strait. She was one of four daughters – and I sometimes feel for my grandfather there. I’ve got my hands full with two daughters, forget having double that plus a farm. Back in those days, having four daughters meant there was no one to inherit the farm, but good luck telling that to my mum. She was, and still is, as tough as they come. She was raised in the shearing sheds and has held her own in more than a few pub brawls. It’s no wonder she was so good at raising three boys. She never took a backwards step and certainly never took any guff from anyone. When the Air Force put out the call she was quick to raise her hand, and soon enough she was flying far, far away from home, all the way to Wagga Wagga. There she met a young man from the Torres Strait Islands with a glint in his eye, who didn’t look too shabby in uniform, and the rest was history. Then, one Christmas, the Air Force moved the young couple and their son to Richmond, northwest of Sydney. And on 12 June the following year my mother gave birth to one of the largest babies the local hospital had ever seen. Ten pounds, ten ounces. Twenty three inches long and cute as a button. The poor mother was only five feet tall herself. The doctors felt for her. But on that day, deep in enemy territory, like a spy on a mission, a Queenslander was born. Lucky for me, the Air Force soon corrected their dreadful error and transferred the family up north when I was still knee-high to a cane toad. We poured into our old Mitsubishi Starwagon and embarked on the longest drive of my life. We made our way through the desert and arrived at the promised land – God’s own country – Townsville. It was a little glimpse of paradise. Our neighbourhood had a football field, a soccer field and an athletics track all within walking distance, and we had a little fibro shack that we could call our own. What more could a young boy want? Our home was a hub of activity. Dad had the islands mentality that says every kid gets looked after, no matter what. There’s no such thing as ‘your kid’ or ‘someone else’s kid’. There’s just kids that need looking after, and if you have the ability to do it, you have the responsibility to do it. I think it’s a beautiful way of looking at things and I’ve incorporated it into my own home now. Our house in Brisbane is always open. There’s always someone coming or going. And it doesn’t just help them, it’s really good for our girls as well. They learn so many things from so many people. They get to see people from all different walks of life. With a little bit of luck, they’ll be able to learn from the good they see in everyone – and even see the bad in people as well, and choose to leave that out. Growing up, this mentality meant we had a unique family dynamic. Mum and Dad had three kids by birth and two more by traditional adoption. Maza had travelled down at eight years old to live with them both when they were newlyweds. Now grown, he’d opted to stay in New South Wales when the family had moved north. Later, my brother Eli would be born and, six months later, Dad returned from a funeral on the islands with another brother, Auda. But that wouldn’t be for a while. At first it was just Reuben and I, wreaking havoc any way we could. We were both really into sport and the walls of the house showed it. We weren’t satisfied playing cricket with a taped-up tennis ball. We needed a proper cricket ball. I’m sure you can imagine how well a fibro shack stands up against a cricket ball coming at full tilt. To this day those walls bear the marks of a thousand hook shots from cricket, foul balls from baseball and even the occasional soccer-style penalty kick that curled perfectly into the top left corner of a closed window. The routine was always the same. We’d hear the crash and we’d scatter and hide. It was always easier if Mum or Dad were home at the time and you’d get into trouble right away. What would really scare you was if they weren’t home. Then you would just sit around in silence knowing that soon you were going to cop a hiding. Like many younger siblings, I was always at the mercy of my older brother when we were growing up. He was a soccer player, which meant that I was goalkeeper. It extended to other sports, too. I was always the pitcher, always the bowler. I’d never get to take the penalty kick or rack up any time at the crease. I can admit now that I was a fairly aggro kid because of that. Games would only last as long as my patience. Soon enough, I’d crack it and the ball would be kicked away or thrown over a fence, and the game was over. My brother knew this and loved to stir me up. We have a love– hate relationship, like all brothers. And yes, he did teach me how to throw and I did use that skill to throw an axe at him – but let me just say in my defence, it wasn’t a very big axe. We were in the backyard, mucking about as usual. Reuben has always been an expert in riling me up and was plying his trade that day. He was riding around on my little pushbike, being a bit of a smart-arse, saying I couldn’t catch him as he rode by. Typical brother stuff. He was right, too. I couldn’t catch him – but I did have a good arm on me and I knew where Dad kept his tomahawk. He’d try to hide it but I could always find it. I took the tomahawk in my hand, hid it behind my back, and waited for my brother to breeze by again. As he zipped past, talking smack, I let it fly. The moment seems to progress in slow motion in my memory. I remember the look in his eyes as he saw the axe spinning towards him. I could see him regretting all those hours he’d spent inadvertently helping me practise my pitching. Luckily, for both of us, my aim was off that day and I missed him. Unluckily for me, I didn’t miss my bike. The tomahawk careened into the back wheel of the bike, shattering a few of the spokes. Needless to say, that didn’t help my anger problems. That’s not to say it was all bad times with Reuben. When we got on, we really got on – but when we didn’t, look out. And I mean look out – it was often more dangerous for bystanders than for us. There was one occasion when my brother and I were coming to blows in the backyard. Poor Mum had bravely stepped in to try to break us up, but had mistimed her intervention. My last punch was already in the air. It clipped her nose, and in my head I started planning to run away to South America and live out my days in hiding. It was either that or face the firing squad with Dad. The problem, more than anything, was that I didn’t have an outlet for all my energy and anger. Those things always find a way out, one way or another – and when you have a young fella who doesn’t really understand his own strength it’s often the house that takes the brunt of the damage. My folks’ place still bears the mark from when I slammed the door shut in some tantrum. The doorstop gave way and the doorknob tore a hole in the fibro. Looking back now, I realise I should probably spend the last year of my rugby league career looking into an apprenticeship so I can learn how to plaster and go back and fix all those holes. I gave my poor parents a fair share of scares, too. My mum still likes to recount how I had to get stitches four years in a row thanks to a brass hose connector to the head, a tent peg through the leg, a machete to the fingers and a tree root through the knee. Honestly, it’s a wonder I ever made it onto a football field. You have to feel for poor Mum, too. It wasn’t just me getting into strife, she had a house full of boys always getting into some danger. She probably spent more time in the emergency room than most doctors. We thought we were invincible and took a few silly risks to try to prove it. The school must have had Mum on speed-dial, she was coming down so often to collect whichever one of her boys was injured that day. But she loved us all and would always be there to nurse us back to health until we were well enough to receive a clip around the ear for being so stupid in the first place. It was a tough childhood with a lot of rough-and-tumble but we were better for it, I think. It was enjoyable. Of course the big dramatic moments stick out in our memories, but it was mostly good, honest fun. Even with my older brother, who I must admit taught me a few techniques that really helped when my little brother came along. Now, Eli’d have a book worth reading. Still, it quickly became clear to my parents that I’d need an outlet for all my energy and angst. Reuben had already been involved in Little Athletics down in New South Wales so when we found a club around the corner, I was sent along too. Mum had a deep involvement with the Little Athletics club. She’d help organise and run the events while her boys competed. Despite the workload, she’d always catch our events. She tells a story about how she was once caught at the far end of an oval, only to look over and see me in the distance at the front of a race. Even then she didn’t miss it. I like that story. There aren’t many where I’m leading a footrace. You have to savour every one. Sport was important for Mum. She was a hockey player growing up and knew the important lessons there were to be learned on the field of play. And it kept us out of trouble. If we were on the field it meant we weren’t running about somewhere else or breaking stuff at home. Also – and this might have been her favourite part – it tuckered us out. I was never too much of a sprinter. I was surprisingly quick, racing barefoot down the track, but frankly, I had a bit too much bulk to really compete. However, I wasn’t half bad at the shotput and javelin. There was one particular carnival that became somewhat of a legendary little tale where I managed to set a school record throwing the javelin well beyond the limits of the track they’d set up for the event, only to lodge it in the fork of a tree. Following that, I ended up being selected for the North Queensland squad and travelling down to Brisbane for the State competition. I even found a bit of running success as part of the relay team. We somehow walked away with the title. Not a bad outing at all! Seeing the stadiums and the big city must have lit a fire inside me. It was when I first dared to dream big. Reuben and I were invited to a coaching clinic and training experience for talented kids in Townsville. I’d like to think it was because we had such exceptional promise but it probably had something to do with every Little Athletics club getting to nominate a few kids and our mum being on the committee. So, maybe there was a thumb on the scale there, but whatever it takes – it’s all good. While we were there, we met Mike Powell, a United States long jumper and a world record holder. I was awe-struck. I wasn’t a long jumper. I could barely get off the track at the best of times. There was no reason for me to be there, but it didn’t matter. He was a superstar in my eyes and I couldn’t miss the opportunity to meet him. I snuck into the workshop and listened intently to everything he had to say, with eyes full of stars. That’s when I decided what I was going to do with my life. I knew if I put my mind to it, I could do anything. I believed in myself and I was going to give it my all. I was going to be an Olympian. 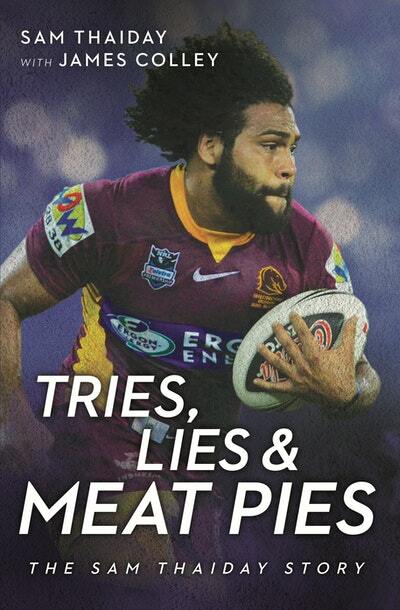 Love Tries, Lies and Meat Pies? Subscribe to Read More to find out about similar books.